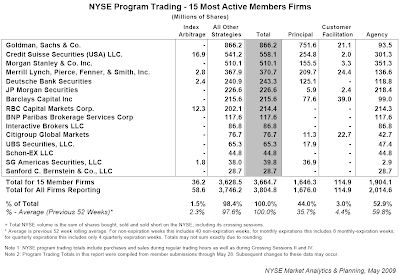 In the week ended May 22, NYSE program trading dropped to a statistically significant low of 2.9 billion shares, down from 3.3 billion the week before, and from a 3.8 billion prior 52 week average. As for specific actors, no surprise, Goldman leading the government’s SLP team with a 7:1 ratio of principal to facilitation/agency. As for today’s market close, with a literally parabolic jump in the last minute of trading, if anyone still thinks this market trades based on anything resembling normal behavior (unless someone had a very Jerome Kerviel-esque fat delta hedging finger or one/two moderate/large quants who had a huge index hedge imploded), I have some BBB+ rated CMBS to sell to you at par. One culprit could be hiding in the huge drop of agency trading, which this week dropped to a several month low of 1.875 billion shares. So as essentially no institutional or retail clients are trading any more, it is just a few desperate computers trying to front run each other. 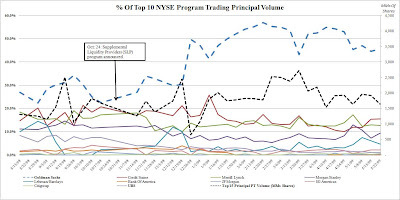 And, of course, for the biggest beneficiary of this PT principal bonanza, look no further than the chart below. 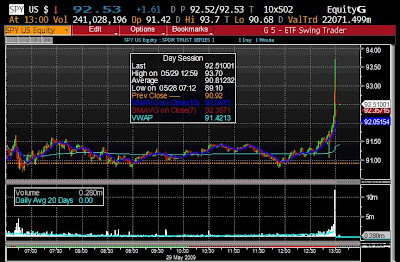 Going back to today’s ridiculous close, the chart below shows it all: the complete tape painting volume spike at the very end of the day speaks for itself. And as computers now simply issue forced stock recall orders to each other, painting the tape wet with manipulative intent and volume spikes into the last 20 minutes of trading every day, their human creators are left on the sidelines, trying to outshout each other as to the reason for why the market keeps rising while the economy keeps tumbling. Is there ever going to be any transparency in this market again? Sign the Fed Transparency Petition HR1207 here.